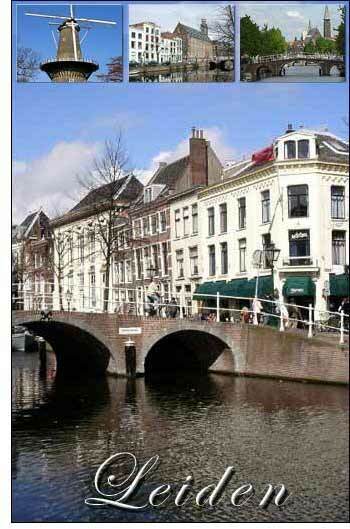 The city of Leiden is located in South Holland, close to The Hague and Haarlem. Leyden or Leiden, in the middle ages Leithen, one of the most ancient towns in Holland (although probably not the Lugdunum Batavorum of the Romans), is situated on the so-called Old Rhine, the sluggish waters of which flow through the town in several canal­like arms. Leiden received its city rights in 1266 and became the centre of the Dutch textile industry when the "Yperlinge" (weavers from Ypres) settled here after the great plague (1347-1350). In the 16th century Leiden sustained a terrible siege by the Spaniards, which lasted from October 31st, 1573, to March 21st, 1674, and then, after a short and partial relief by Count Louis of Nassau, was continued as a blockade down to October 3rd of the same year. William the Silent at last caused the South dykes to be pierced, and the country being thus inundated, he relieved the besieged by ship. According to a popular tradition Willem, the Prince of Orange offered to reward the citizens for their gallant conduct in the defence of 1574 by exempting them from the payment of taxes for a certain number of years, or by the establishment of a university in their city. The latter alternative is said to have been preferred; at all events, the prince founded the Leiden University in 1575. Its fame soon extended to every part of Europe. The greatest scholars of their age, Scaliger, Hugo Grotius, Dodonaaus, Salmasius, Ruhnken, Wyttenbach, and Boerhaave (who founded the fame of the medical faculty in the 18th century), resided and wrote here, and Arminius and Gomarus were professors at the university. Lord Stair (died 1695), the celebrated Scottish jurist, spent several years in exile at Leiden, whence he accompanied his future sovereign, William of Orange, to Great Britain in 1688. Leiden was the birthplace of several of the painters of the 16th and 17th centuries: Lucas van Leyden, Joris van Schooten, Jacob van Swanenburgh, the great Rembrandt van Ryn, Jan Steen, Gerard Dou, Gabriel Metsu, Jan van Goyen, Frans van Mieris, Pieter van Slingelandt, etc. It possesses, however, but few specimens of their works. In the seventeenth century the Pilgrims lived in Leiden, the first settlers of New Amsterdam, nowadays New York, before they departed by ship to the New World.